Experience the Thrill of exciting adventure packages created exclusively for your groups, incentives, special, business, travel, corporations, family and friends. We are the original trusted company with over 23 years experience in providing exceptional Thrilling experiences. Supplying hands on immersive awesome activities and events throughout Australia and now guided or hosted adventures all over the world. From Abseiling to Canyoning to Diving the Great Barrier Reef and Indonesia Flores with Manta Rays. Flying Helicopters out to remote Islands, over glaciers in New Zealand to Hot Air Ballooning and Skydiving Thrills over the Beach from Sydney to Byron Bay. Or Adventures on the Water Sailing the Whitsundays, Cruising and extreme flying, driving or Jet Boating. To the ultimate adrenaline fueled Rally and Sports Car Driving experiences that are the ultimate all terrain Thrill. Get behind the wheel and take hold of your life’s dreams. Select your next escape adventure package…. Nominate your bucket or wish list of the most spectacular experiences you can imagine – contact us to let us know what inspires and motivates you, your colleagues or your loved ones. Thrill provides your group and the organisers with an itinerary overview of ideas and costs for you to achieve those life goals and live the dream. We discuss your personal and group goals check through the bucket list activities and identify the key components to making it a success. Our Thrillster team will create the itinerary and even train your group to be ready for the adventures. We analyse all aspects of the risks and ensure adequate insurance before venturing into the unknown. Here is a starting point to get ready and Thrill your Team. Skydiving over The Beaches in Byron, Wollongong and Cairns. Drop zones in Sydney, Hunter Valley, Goulburn and Gold Coast. Hot Deals on any experience fro groups pf 4 or more. Walking and Hiking Adventures across Australia and Sydney. SCUBA Diving and Surfing along the Eastern Beaches from Gerringong Nowra to Byron Bay and The Gold Coast Surfers Paradise. Team Building, Team Activities, Team Development, Leadership Training in Sydney and the Gold Coast to remote areas and with Unique rugged or Luxury accommodation. Rafting, Raft Building, White Water Rafting from The Snowy Mountains to Nymbodia and Tully Rivers, Cairns Queensland. City Tours of Sydney, Brisbane, Gold Coast, Adelaide, Melbourne and Canberra with professional guides. Reef Tours from The Whitsundays to Cairns along the Great Barrier Reef’s exclsuive dive sites and Islands. 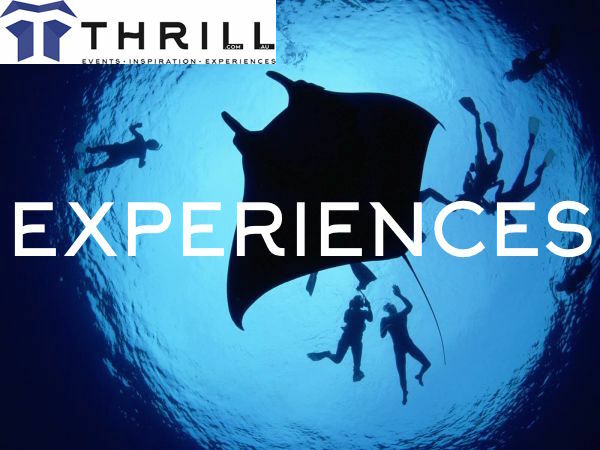 Discuss with Thrill 02 9630 2222 or complete the enquiry form below to get your groups Thrilling Experiences started!